I ought a cheap-o mattress a long time ago. Did I post about it? Anyway, it was never used and it needed to git gone. A soon-to-be mom posted a request for a mattress on Facebook: she needed a full-size mattress for when her mother-in-law came to help with the baby. We connected, but the deal fell through. 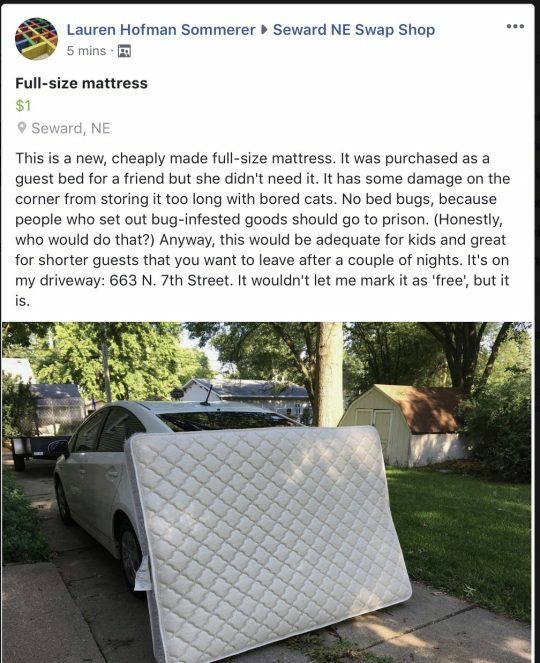 The mattress has been sitting in my entryway for more than a week, so I posted it on our Facebook swap page. As it turns out, a co-worker wanted it. Her son’s mattress isn’t in great shape, so she took it home. I saw that when I drove past your house. Ow I know the story. Thanks. Too bad you don’t have a burn pile in your back yard. That would have been a great way to take care of it.